Hey guys! 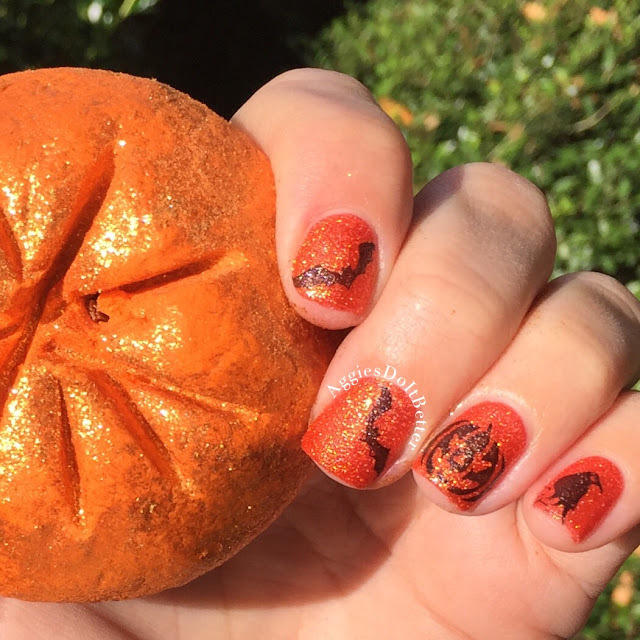 Today I have the Lush Sparkly Pumpkin to review. This was part of my first ever Halloween Lush order a few weeks ago. I have lots and lots to say about it, let's dig in! I had a HECK of a time holding this time for a picture. And, really every time I had to move it around here or there. There's so much glitter on it I always got super annoyed!! I think its supposed to have a piece of cinnamon stick in there for a "stem", mine didn't, but it might have fell out during shipment and I didn't see it in the box. First up, I chose Zoya Dhara to match! 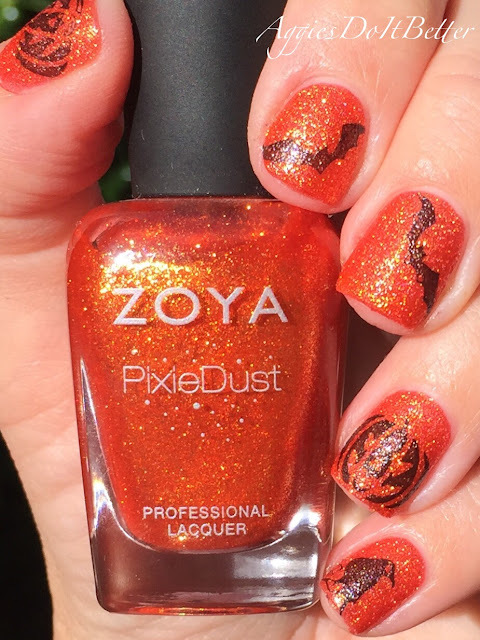 It's a bright reddish orange pixie dust (texture) with a really strong gold shimmer-it went perfectly! The Halloween designs are made with OPI Black Onyx and my new (purchased also) Pueen Halloween Party 01 stamping plate. I'm still digging in and going right for the stuff I consider slightly advanced, like stamping on texture! 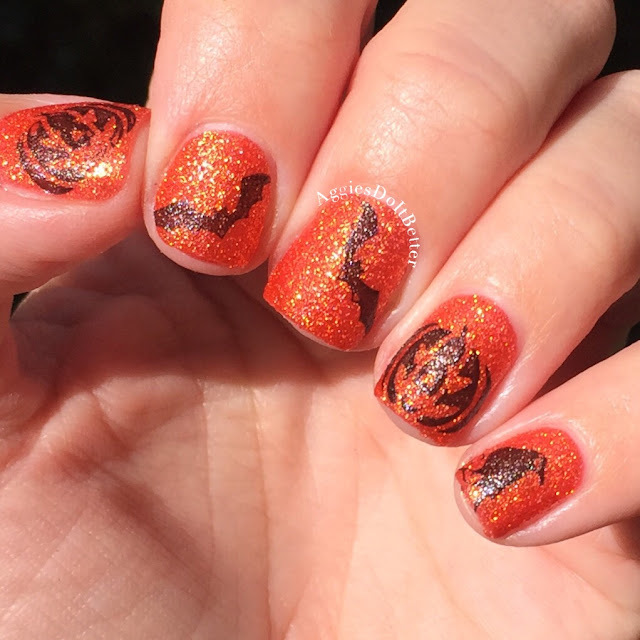 I was really nervous to use Sparkly Pumpkin because of all the glitter. I even considered washing some off before I used it so I wouldn't be completely covered in glitter when I got out of the tub. But then I decided to go ahead and use it as it is and just give it a chance. I will say it does smell really, really good. I ordered two of the pumpkin bath bombs and didn't really love the scent that much. You can see in the video I had a little bit of a hard time cutting it – it did seem like it was a little bit drier than the rest of the bubble bars I have cut up. The main scents are Juniperberry oil and lime oil and I didn't really pick up either of those! To me it smelled more of a like more of a cinnamon-vanilla cupcake type smell. I had it sitting right next to me when I was painting my nails for this post and I really noticed how good it smelled for the first time. And then when I used it in the tub the smell stayed the entire time and I never got any much too much of a spicy smell--other than the cinnamon. Maybe my nose is broken? I don't know why it kept coming off so much like a vanilla sent to me! Either way, it's quite lovely. I wound up using half the bubble bar because I really wasn't expecting to like it, normally I only use a third or a fourth of one. And it did make a ton of bubbles! Look at all the bubbles! wow! The bathwater did turn a bright shade of orange which you can see in the video. I'm not a huge fan of that but I could tolerate it more for a product that smells good like this one and not so much for the pumpkin bath bomb.